A strange old name for a part of a ship, the tumblehome. Though I suppose the bee, or the bilge, or the binnacle are equally bizarre. Warships had them for centuries: a tumblehome was the part of the ship which narrows as it rises. The old warships were wide half way down but narrowed towards their top. Think about it: if you were next to an enemy ship, your battleship’s wide middle would keep them at bay while your men were stoking the canons. By the time they attempted boarding, it might be a perilous venture. I love the tumblehomes in that old picture, packed with event, showing the embarkation of Henry VIII’s party for France at Dover. All those tumblehomes, bobbing up and down on the Channel, stuffed with Henry’s people. As time went on, and the Europeans began sailing further and further afield, it was not just battleships which had their tumblehomes. All the tea in China and India beckoned; and tea clippers became a familiar sight on the high seas. Whilst they carried vast arrays of goods and took paying passengers, they were not above mimicking the warship. Some were painted with pretend armouries, while others were armed with cannons and could hold their own in a sea-skirmish. They, too, had tumblehomes, which came in handy when the pirates wanted to get their hands on the riches -and rich folks – inside.A tumblehome could generate vital seconds in a surprise attack. Yet sometimes, nature renders the tumblehome an insignificance. 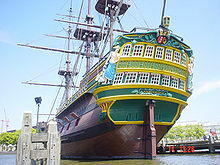 is a replica of a ship which left the Netherlands in January 1749 with high expectations, bound to sail round the Cape and thence to Java. It was dubbed the Amsterdam, and this was its maiden voyage. 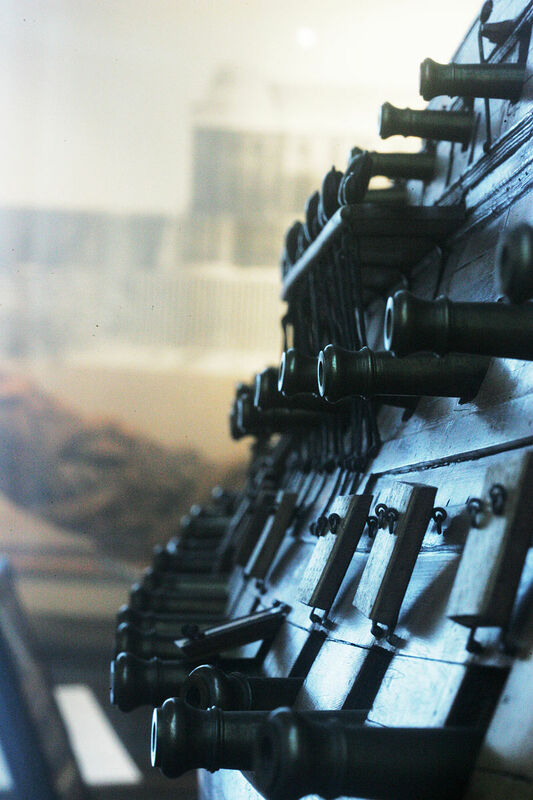 It carried textiles, wine, stone ballast, cannon, paper, pens, pipes, domestic goods and 27 chests of silver guilder coins to purchase goods when it arrived in Java. There were thirsty coffee houses all over Europe to supply, and rich pickings were to be had for successful expeditions. But this ship was unlucky. As it sailed along the English Channel a kind of plague hit the Amsterdam. A malaise which claimed life after life and spread panic. Fifty of the boat’s 333 crew, passengers and soldiers died and another 40 were staring death in the face. It was just as the mood on the ship was becoming dangerously mutinous that the gales hit. The first thing to go was the rudder, in Pevensey Bay, and you can’t have a ship without its rudder. Men grew treacherous with fear: there are reports of shooting on board, and there is evidence they broke into the cargo of wine and drank Dutch courage. They would, it transpired, need it. Because the gales grew murderous themselves, and forced the great merchant ship onto the flat sand-and-clay beaches at St Leonard’s which gaped, open-mouthed, to receive it. The crew waited for low tide, and then climbed out, away from that tumblehome, never to return: leaving it and its contents of 2.5 tonnes of silver bullion to the local smugglers. And the strife did not end there, because looters are not gentle creatures. A man was shot on the beach in an argument over some of that bullion. He never got a trial after the Hastings coroner concluded neatly that he had died at sea. The gales blew over, and the remainder of the loot was taken away by the authorities, and people began to be accustomed to the sight of a wreck at Bulverhythe beach, West St Leonards. It sank around eight metres in just a few months, and very soon it settled comfortably into the sand and clay. It’s still talked about now, and at a low tide the great old ship pokes the remainders of an elderly tumblehome above the sands. And then the seas return, and reclaim their oak-framed prize which has so stubbornly stood the test of time. With thanks to the Shipwreck Museum at Hastings, whose excellent post here informed this one. Posted in Quirks of HistoryTagged Bulverhythe, hastings, history, shipwreck, shipwreck museum, tumblehome, west st LeonardsBookmark the permalink. We have a number of shipwrecks around the surrounding islands ~ great for dive sites and underwater memorial signage. I’m sure the rum will have had a part to play, Nancy. Diving a shipwreck….here if you want to do that you need tick wetsuits, visibility gear and a large dollop of expertise; I envy you those azure seas. I have never heard the word “tumblehome,” Kate, and really didn’t know a thing about these magnificent ships. Isn’t that a great post card with the old ship poking up! I find it interesting that there is a Shipwreck Museum! 🙂 There is no end to what we can explore, is there? Fascinating story! Hi Debra -No, you and I are both addicted to exploring history. 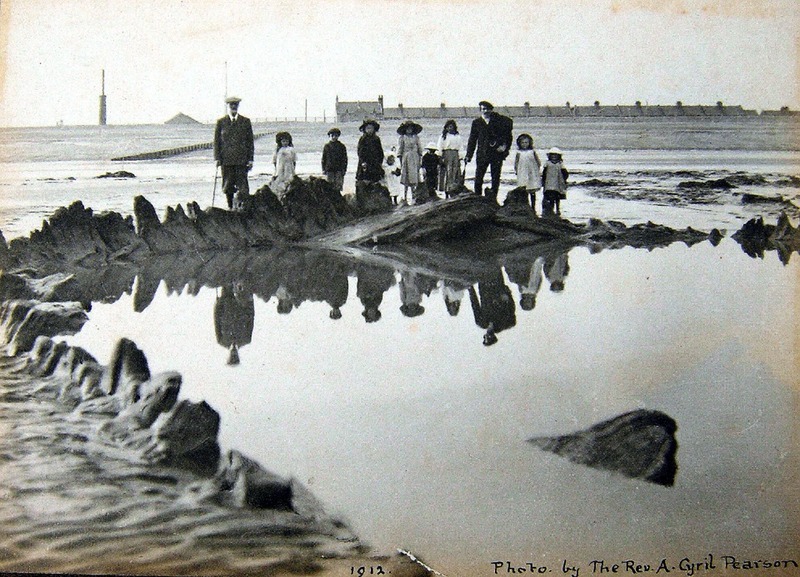 I love your history posts: everywhere has a wealth of story beneath the surface, and yours are so very different to mine they seem most exotic, involving the search for water and the stories of settlement. I have someone going out to check it for me today, Brenda: we will be able to see if it is the ship’s mid-point or the tumblehome which has survived. I wonder how many beaches have swallowed ships whole. Perhaps viking ships are down there, too.